Special 2-1 is the first level of Special 2 in Super Mario 3D Land. The player starts out on a small sandy platform before moving to a grassy platform. After this, the player will go onto some Jump Blocks to go to another platform, before proceeding onto moving platforms which lead to another small platform with a Piranha Plant on it. After this there are some more moving platforms that have Piranha Plants and Fire Piranha Plants on them. One of the platforms has a Red Ring that will spawn 5 Red Coins on a platform with two Piranha Plants, if all the Red Coins are collected in time, the player will receive either a power-up or a 1-Up Mushroom. The rest of the level is generally the same. Eventually the player will reach a Warp Box which will warp them to the final area. 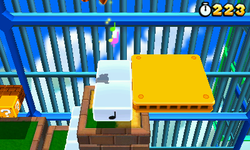 In the final area is one moving platform with a Piranha Plant, which must be used to get to the top of the Goal Pole. Star Medal 1: Located on the first set of Jump Blocks. Star Medal 2: Located on rising platforms near a Fire Piranha Plant. Star Medal 3: Located on the Castle in the final area. This page was last edited on April 5, 2019, at 18:20.